After the town of Yauco was taken, Major General Nelson A. Miles decided to attack the City of Ponce by sea and by land. General Garretson's 6th Illinois and 6th Massachusetts had returned to Guanica and after the troops rested, Garretson and his men were ordered to move eastward to Ponce. Lt. Col. Rafael Martinez Illecas, in charge of the Spanish forces in that city, had pulled out, leaving behind a small garrison of 300 volunteers to hold the town. 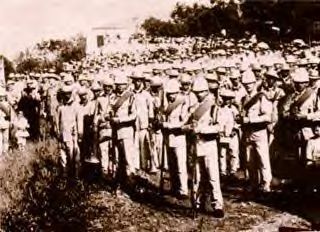 When the American forces arrived in Ponce they met no resistance and the Spanish volunteers surrendered to the invaders. Miles and his men were greeted by a committee headed by Rosendo Matienzo Cintrón who provided the general with a banquet in his honor. He named Matienzo Cintrón President of the Ponce Audience, a position which he held until 1899. Miles then ordered Brigadier General Peter G. Hains and the men of the 3rd Illinois, 4th Ohio and 4th Pennsylvania Volunteer Infantry Regiments to take Arroyo, a small port 60 miles east of Ponce that served the larger, nearby coastal town of Guayama. Arroyo was taken on August 2 and on August 5 Hanes ordered the 4th Ohio, the 3rd Illinois and a battery of Sims-Dudley guns, manned by Company G of the 4th Ohio, to capture Guayama. Spanish forces were entrenched on the crest of two small hills, between which the road from Arroyo to Guayama ran. The Americans had crossed a stream in front of the hills when suddenly the Spanish opened fire. The Americans protected their position by the stream and increased their fire power as more reinforcements arrived. The outnumbered Spanish troops retreated to Guayama as the Americans made their advance on the hills. The firefight, which lasted half an hour, left three American wounded. When the 4th Ohio entered the town they discovered that the Spaniards had fled north and abandoned the city, ending the Battle of Guayama. General John Rutter Brooke used the Cautiño Residence (Casa Cautiño) by the town square in Guayama as his military headquarters.